Heres a good rockery perennial to plant within you rockery or scree bed. The clump forming perennial Alyssum saxitile is commonly known as the "Basket of gold". This native of Europe is evergreen and grows no higher than 20 cm (8 inches); it has a spread of approx 30cm (1ft). Because of its size and its ability to tolerate drought it is ideal for planting in cracks in your paving, crevices in your walls and of course in the rockery. 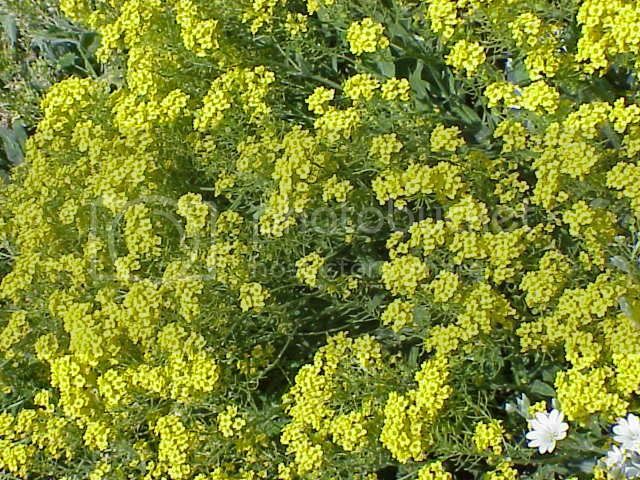 From April to June you can expect to see clusters of tiny vibrant yellow flowers above its grey-green leaves. Alyssum saxitile requires a position which drains freely and receives upwards of 4 hours sunlight a day. If you would like to attract some butterflies to your garden then plant clusters of Alyssum throughout, sit back and watch as the yellow flowers draw them in.